The Winner Jr. Legion traveled to Martin to take on the Bennett Co. Legion team on Wednesday night, June 27. Winner won Game 1 by a score of 11-9. Offensively Kolbie Osborn went 2 for 2 with a run scored. Adam Cole was 2 for 3 with 2 RBI’s and 2 runs scored. Zach Bohnet was 1 for 3, scoring 3 runs and driving in another 2. Jesse Colson also had 2 RBI’s. Aaron Gilchrist started on the mound and went 3 innings, giving up 2 earned runs on one hit while striking out 6 batters. Phil Jorgensen closed the final inning allowing one hit and no runs. Winner took Game 2 as well by a score of 16-4. The game ended after the 5th due to the 10-run rule. Offensively Oscar Pravecek led the way going 2 for 2 with 2 RBI’s and driving in 2 runs. Dalton Baker went 3 for 4 scoring 3 runs and an RBI. Colby Kaiser was 3 for 5 driving in a run and scoring twice. Kameron Meiners and Shea Connot each had 2 hits and scored 2 runs. Jacob Beckers was the starting pitchers and pitched 2.2 innings, giving up one run on no hits, while walking 6 and striking out 7. Evan Farner and Oscar Pravecek finished up on the mound. Winner lost Game 1 to Stanley County by a score of 6-0. Offensively Joren Bruun was 2 for 3 at the plate. 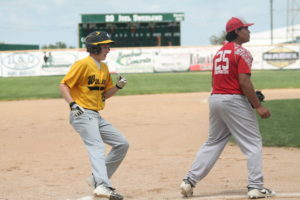 Jesse Colsen and Colby Kaiser had the only two other hits. Joren Bruun started on the mound and pitched 1.2 innings giving up one unearned run on one hit while striking out 3. Bruun was on a strict pitch count which led to the short outing. Aaron Gilchrist and Bosten Morehart pitched the final 2.1 innings, neither allowing an earned run as Winner committed 5 errors in the field. Winner defeated Stanley Co. by a score of 16-3. The game was called in the 5th inning due to the 10-run rule. Offensively Oscar Pravecek went 3 for 3 with 3 RBI’s and was hit by a pitch twice. Fred Whiting went 2 for 4 and drove in 4 runs. Evan Farner was 2 for 3 with two RBI’s as well. Kameron Meiners started on the mound and pitched 3 innings, giving up 2 runs (0 earned) on three hits while striking out 4. Jacob Beckers and Bosten Morehart pitched the final two innings in relief, neither giving up an earned run. With the win we move to 13-3 on the season. The next game is Wednesday July 4 at Gregory. Game time is 6 p.m.